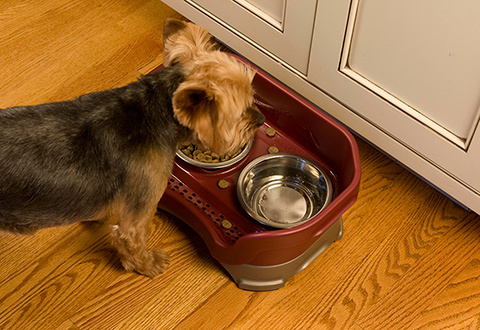 The Mess Proof Pet Feeder separates and contains spilled food and spilled water, so your floors stay clean and dry. 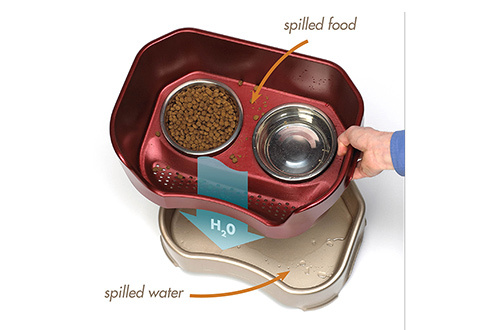 Its unique, two-level design that keeps spilled food contained in the top level, and spilled water in the lower level. 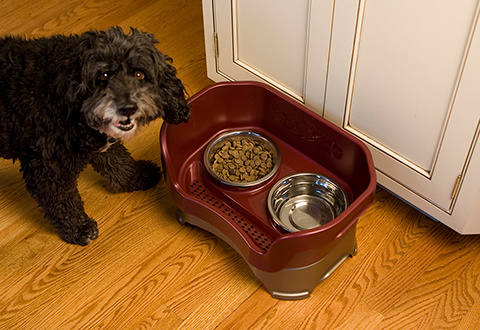 Plus, the raised design makes it more comfortable for your pets to eat, with less strain and better digestion. 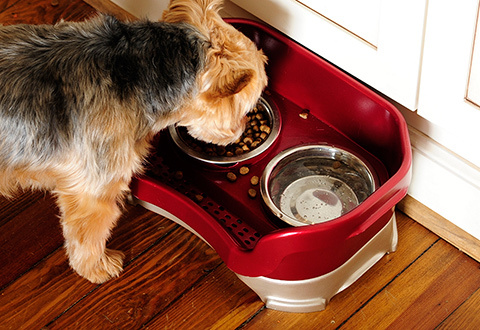 Includes stainless steel food bowl, stainless steel water bowl, durable plastic frame ad non-skid rubber pads. 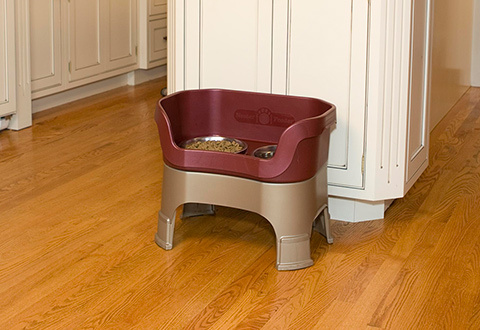 Available in four sizes: Cat (all sizes), Small Dog (shoulder height up to 9" or weight up to 18 lbs. 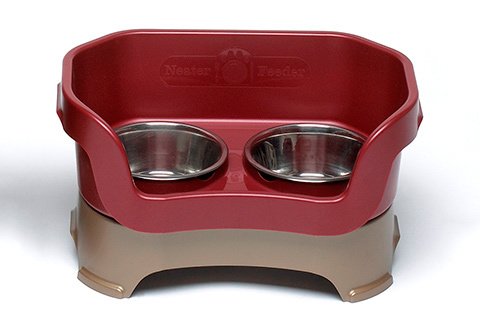 ), Medium Dog (9"-16" or 15-40 lbs.) and Large Dog (15"-21" or 35-100 lbs). 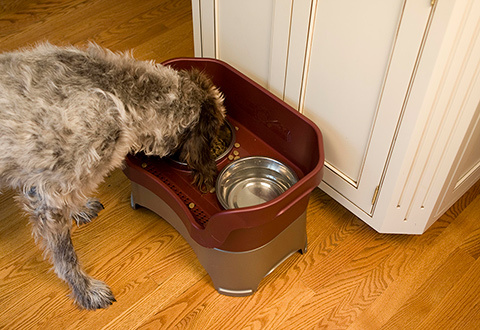 The Mess Proof Pet Feeder makes it easy for pets to eat… and neater too. 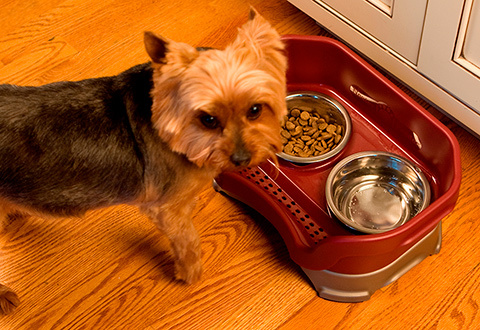 The unique design traps food and water on separate levels, and away from your floor. 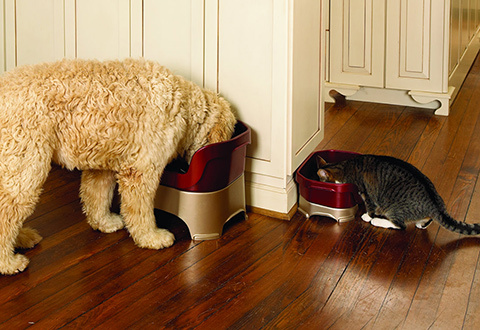 - Cat (all sizes of kittens and cats, with shoulder height range up to 6”) includes 1-cup and 1.5-cup stainless steel bowls. 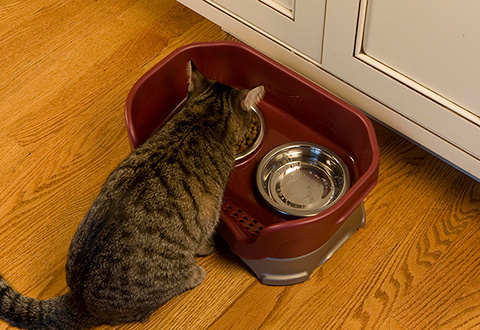 Cat feeder can be placed on the floor or a counter. Bowl height: 3” from floor. - Small Dog (shoulder ht. up to 9" or up to 18 lbs.) includes 1.5-cup and 2.2-cup stainless steel bowls. Bowl height: 3” from floor. - Medium Dog (shoulder ht. 9"-16" or 15-40 lbs.) includes 3.5-cup and 5-cup stainless steel bowls. Bowl height: 5” from floor.